NASA’s exploration of the Martian system continues to intrigue Pound360 with a new set of hi-res pictures. 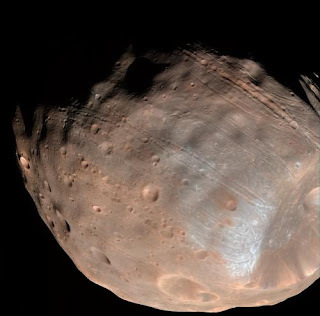 The latest set of snapshots are not of Mars, but one of its moons, Phobos. Yes, Mars has moons. Two of them (Phobos and Deimos), both “thought to be captured asteroids,” says the BBC in a write up on the Phobos photos. Cratered. Grooved. One ugly SOB. Phobos has taken quite a beating, you can tell. But it may end up as the foundation for a beautiful set of rings in another 50 million years or so. As it turns out, Phobos is locked in a descending orbit. Every 100 years, explains the BBC, Phobos’ orbit sinks about 6 feet. This means “it will either crash into Mars or break up into a ring.” Either way, Earth observers (whether they be our robot offspring or advanced cockroach astronomers) are in for quite a show. White Bread Better than Whole Wheat? Climate Crisis: Is Diesel the Answer? When Did Humans First Walk the Americas? This Cancer Study Funded by… A Cigarette Company? Cell Phones More Dangerous than Smoking?